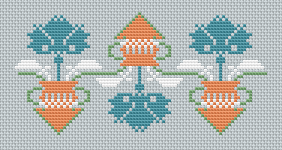 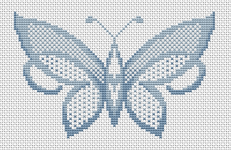 If you like butterflies and blue colors - this is the perfect pattern for your cross stitch projects. 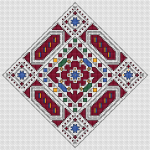 All we need is love, it's a fact. 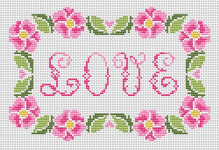 Now we can stitch these four letters as a small picture in a beautiful floral frame - a great gift for our loved ones. 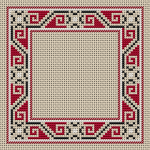 A beautiful motif from the rich Bulgarian heritage - the incredible authentic embroideries filled with a great sense of beauty and symbolism. 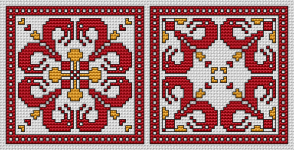 Cross stitch pattern of two ornaments in red in the style of Bulgarian traditional embroidery. 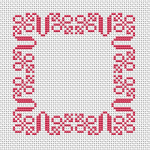 Small floral motif with pink roses suitable for bookmarks making. 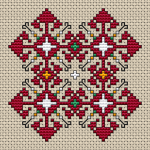 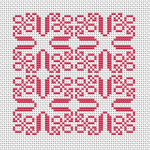 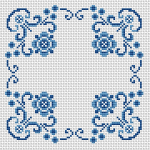 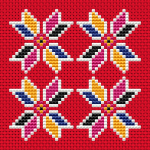 Colorful floral motif on red Aida suitable for biscornu making and other cross stitch projects.